Yup, I'm pregnant - and now 9 weeks so. So the folks who suggested that I was pregnant then, during the random giddy spells, were all right! Just that I didn't know it myself. After a few happy days of discovering this pregnancy, I fell into 2-3 weeks of utter disarray - exhibiting textbook pregnancy symptoms. I got bouts of intense tiredness and giddy spells. My tastebuds changed, and I could not keep my food down, running to throw up a few times a day. I have never vomited so much or so violently like I did those few weeks. The doctors gave me a couple of days of much needed medical leave just to rest, and rest I did, for I could not really function normally at all. When I did have to go out, I always had in my bag 2 plastic bags for the inevitable puking that would occur. Now however, I am thankful to seem to have survived the worst of the Morning (I'd say "All Day") sickness. I feel my energy coming back, and I am keeping my food down a lot more. I suspect it has partly to do with the huge dosage (50mg/day) of VitB6 that my gynae prescribed me. 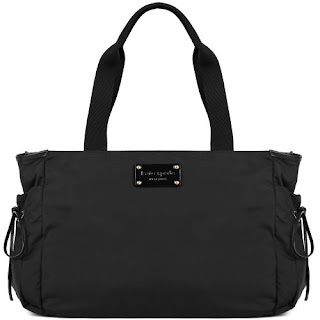 In the meantime, I received this Kate Spade diaper bag! A dear friend bought it for me in anticipation of my getting pregnant =) Isn't that so sweet? I love the polka dots on the inside, and it matches my other Kate Spade bag! am very glad to see you getting your appetite back too. :) now to make good of my promise of being a babysitter. HEH. yipee yipee yayy yayy!! Congratulations my dearest friend!! :D welcome to the club!! heeeeee!!! Babe, CONGRATS!!!! Can I be irritating and say... I KNEW IT! Otherwise, you wouldn't be getting all the weird symptoms! Congrats! i *thought* the disappearance was due to a lil bub but didn't want to probe. Let me know if you need anything! I'll send you the babylist soon! yay, congratulations! thought it might be the case when you "disappeared" and esp when you mentioned being tired and wiped out but didn't want to ask (i totally hated the pregnant questions when i wasn't actually pregnant). so happy for you! woah it's so exciting! congrats! I was the first one to comment on yor *whining post* last time. And I was so moron to suspect tat u had cholesterol issue. Hahaha..!! Btw, I was tagging you on my earlier post. Do the challenge if u have the chance,ok? wonderful news..same o'l saying ..pls eat and rest welll!! Congrats! So happy for you.. it's really a good news to start the new year. :) Take care! Will keep you and baby in prayer! cote-p: Thank you my dear friend. You have been a tremendous support! yuling: Hahahaha you KNEW???? Actually one week before I tested positive, I tested too - and got a negative result. So I truly thought I was just unhealthy. cindy: Thank you - it is a blessing :) I've lots to learn from you too! lms: YOU suspected too? Wahahahaha!! What is a baby list? Yes I would be asking for lotsa advice from all you girls soon. First stop - where to get nice maternity wear?! I've bought a couple of things from Old Navy and ASOS. Waiting for them to arrive to see if they fit! beanbean: Thank you for understanding. I hated those questions too when I was not actually pregnant! But yes I have been so tired on a daily basis. Like a ragdoll some afternoons. celcilia: Hahaha - it is ok. Oops I didn't see that post - will have a look at it soon. poiema: It is almost like I can't help taking things slower anyway. I still feel like I'm a little ill everyday. haha. I go to Gleneagles. Will drop you a mail soon. candice: Thank you! Haha I can't believe so many people guessed! Yes I didn't know when to share it, and when I did want to - I just couldn't formulate the words. But news have spread so much that I thought oh well. Haha. tiffany: THANK YOU!!!! The baby is a gift I gratefully receive. KLH: Thanks for sharing my joy! It is a great way to start the year really! oh congratulations! *MUACKS* I'm SOOOOO ridiculously excited for yoU! And i love your diaper bag! bagelgal: Haha, thanks for your excitement! I was more excited before all the morning sickness set in. Looking forward to 2nd trimester! Yen Chiew: Thanks! I'll have lots to learn from all the mummies! Jamie: I sure hope 2nd tri will be better! Thanks for the assurances though :) And yup, I REALLY like the bag - am so pleased with it!